This 12V Auto Turn-off Battery Charger with current limiter, uses only 4 transistors, will stop charging the battery when it has 14 volts between its terminals and limits the charging current to a maximum of 2 amps. These precautions avoid an overvoltage in the battery and that the circuit under load will be damaged if it delivers a current higher than 4 amps. At the beginning of the charging process, the circuit is activated by turning on transistors Q3 and Q4. In this charging stage, transistors Q1 and Q2 have not yet come into operation. How does automatic turn-off work? 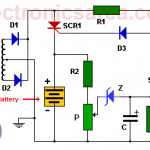 To achieve automatic battery turn-off, a voltage divider implemented with resistors R4 and R5 is used. When the voltage in the battery is 14 V, the voltage divider creates a voltage of 0.65 V between the base and the emitter of the transistor Q2, causing it to enter the conduction region. The emitter-collector current of transistor Q2 increases the base current of transistor Q1 which in turn decreases the base current of transistor Q3 and consequently transistor Q4. This eventually causes these last two transistors to go into cutoff and not allow more current to flow into the battery. How does the current limitation work? If the load current is 2 amps, there is a voltage of approximately 0.94 V at the terminals of the R7 resistor. 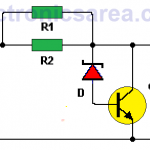 This voltage charge the C2 capacitor through the R3 resistor. 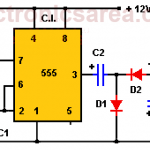 This voltage is applied between the base and the emitter of transistor Q1. (0.65V approximately) and activate Q1. 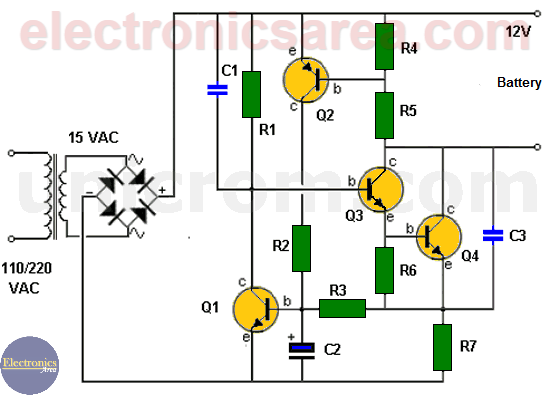 The transistor Q1 start to conduct and remove some of the base current from the Q3 transistor, which in turn removes a bit of base current from the Q4 transistor which determines the amount of charge current.